Scruffy Kitty is a stray cat that manages to find a home in this cute little digital book from Winged Chariot. Each page has one or two interactive elements that the child can trigger by tapping on the pictures. The interactions play only once and are easy to identify (mostly touching the kitty himself), making this book ideal for the youngest children. The story is also heart-warming, about an alley-cat that is invited inside by a loving family that bathes him and gives him a home. This title has simple page swiping and very intuitive interactivity. There is also a small 'extra' that lets the child pick images or 'digital stickers' from the story to create their own picture. Simple controls allow the child to tap a picture and then tap the blank screen to add each 'sticker'. The sticker can even be made bigger or smaller with two-finger pinch. Once the stickers are placed the way the child likes them, a heart button saves a copy to your photos, or you can erase it and start over. Scruff Kitty is one of my son's favorite book apps, making the top ten list just published today in the blog (Click HERE for article). This kitty is adorable and funny. My son's favorite scene has the cat in the bathroom, sliding across the floor on a bar of soap. He giggles so much I won't let him eat while we read this title, for fear he'll choke! As a mom, I also really liked the storyline. Scruffy Kitty wins the family's heart, and I predict he'll win yours, too! 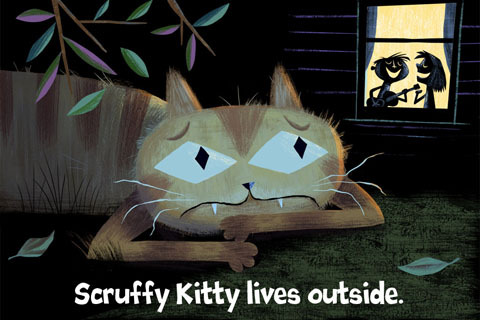 Scruffy Kitty is a book about a stray cat. He eats 'treats' out of the garbage, howls at the moon and chases mice. But he lives outside and is very unhappy watching the warm scenes inside. After scratching on the door, one couple lets him in. They fall in love with him, give him a much needed bath and then, "Scruffy Kitty is not so scruffy." Now he is warm and fluffy and falls fast asleep in his new loving home, purring deeply. The book ends with, "Goodnight Fluffy Kitty."